Following the announcement of its new ownership structure in 2018, ParkCloud’s new phase of growth spearheaded a need for a more collaborative work space to accommodate the developing needs of the business, in addition to the diversifying the working environment for its expanding team. With Manchester city centre the heart of the North’s technology and innovation hub, ParkCloud’s new work space, operated by Central Working, employs a more interactive way of working, with a relaxed club-style central working area, hot-desking, state-of-the-art technology and meeting facilities and weekly event incentives for staff. 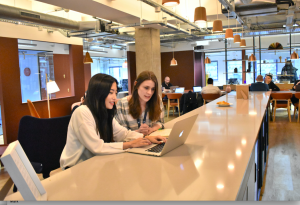 “As a progressive technology company operating in a diverse range of global markets, our team are paramount to the continuing pattern of success ParkCloud has achieved, and as such, optimising the working environment to garner more opportunities for collaboration and innovation was the next logical step in our commercial growth plan. In July 2018, ParkCloud expanded its shareholder base with investment partner, Mercia Fund Managers, which was shortly followed by the appointment of a new management team to focus top line development into strategic areas of the business. Connecting the world’s drivers with parking spaces, ParkCloud allows drivers to pre-book airport, city, station and port parking at over 2,000 car parks in 42 countries.